American Airlines Flight 2352 from Los Angeles to Dallas/Fort Worth was diverted to Wichita Falls, TX Thursday night due to strong thunderstorms in the region. The flight landed safely, but there was no flight out of Wichita Falls until Friday morning, leaving 159 stranded and frustrated passengers in a small airport. The captain of the flight, Jeff Raines, was stuck too. And he decided to do something to help out the tired, hungry travelers. 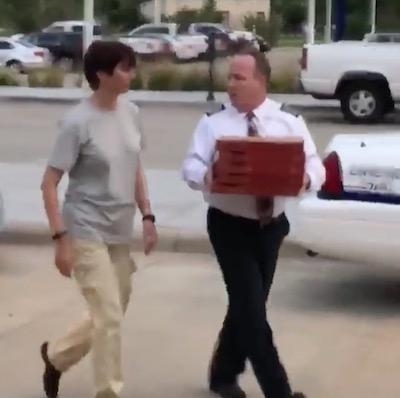 He called a local Papa Johns near the airport, and had 40 pies delivered. Fox News reports that while Capt. Raines is receiving accolades on social media, where a video of him helping deliver pizzas has gotten a lot of attention, he said everyone on the crew was involved in the effort. “All of us are always proud of our crew members who take great care of our customers who fly on American Airlines. We are fortunate that our crew members are the best in the business,” the airline said. The flight continued on to DFW on Friday morning, according to the report.